said the Iranian ambassador to Iraq, Iraj Masjedi, he will soon be the opening of a permanent exhibition of Iranian goods in Baghdad. 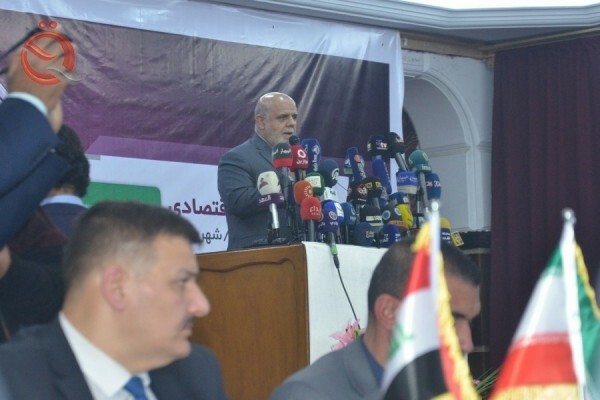 "The exhibition will be opened in the presence of ministers from the two countries," Masjedi said in a speech at the Great Economic Forum between Iraq and Iran in Baghdad on Monday. He added that "the exhibition will be held for the first time and for a year and is the largest economic event between the two countries," adding that "each week will showcase the productive and industrial capabilities of Iran in one of the specialized fields in the sense that will be in a year of 48 exhibition specialist." The meeting was attended by the Iranian high-level political and economic delegation headed by Foreign Minister Mohammed Jawad Zarif with the ministers of finance, electricity, trade, transport, communications and housing Iraqis as well as the Iraqi Investment Commission as well as hundreds of directors of companies and economic and industrial activists in both countries.